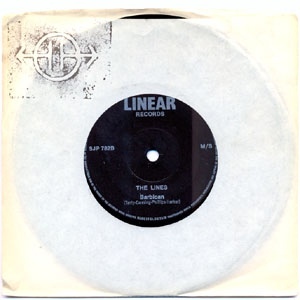 The B side of the first single was another ode to the metropolis, an expression of our delight with the grubby, miasmic London of the mid 70s. The shiny new towers at the old city gate seemed to herald a way forward for this oldest part of town. Surveying the modern assortment of architectural gewgaws, one can only wish that a similar standard could have been maintained; but prophetic these buildings certainly were. I still find this track quite compelling. Another of our sequences that we would play for hours, this one had Jo Forty asserting a more melodic role for the bass, while I employed a kind of sitar style on the guitar, letting open strings ring a G major chord whilst pitting descending inversions against it. It also features the same Yamaha trombone that I played during my school years.